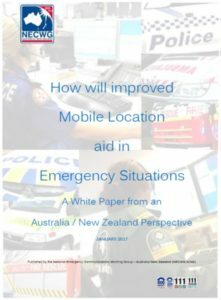 NECWG-A/NZ has been an advocate for enhanced Mobile Location Information (MoLI) for many years. MoLI is the highest priority of information required by emergency service organisations when it comes to responding to requests for emergency assistance. NECWG-A/NZ has released a White Paper that discusses current activity around the world; the benefits to emergency services, industry, and the community; the considerations, the risks, and the next steps in the development of enhanced MoLI.